The trend of porting a mobile OS to a tablet isn’t a new one at all. After all, mobile OS are much finger-friendly than the full featured OS that we mainly use on our laptops and desktops. Here, designer Umang Dokey has taken inspiration from the same approach and made a concept tablet that runs on Windows Phone 7 OS. The Tablet has a 8-inch capacitive touch screen, 2 web cams for 3D video calling, an in-built stand and a keyboard. 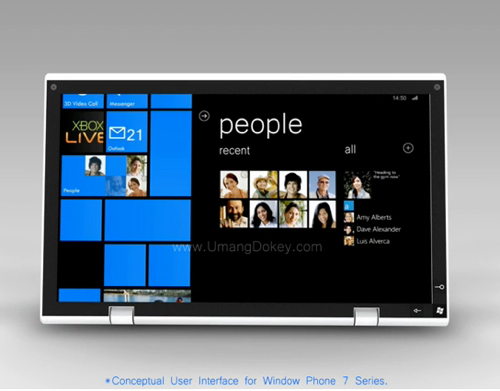 Tablet Concept – running Windows Phone 7 OS from umang on Vimeo. Interestingly! other companies like Apple and Google have already begun to make tablet-devices out of their mobile OS, so something like the Windows Phone 7 OS Tablet shouldn’t be far from reality.